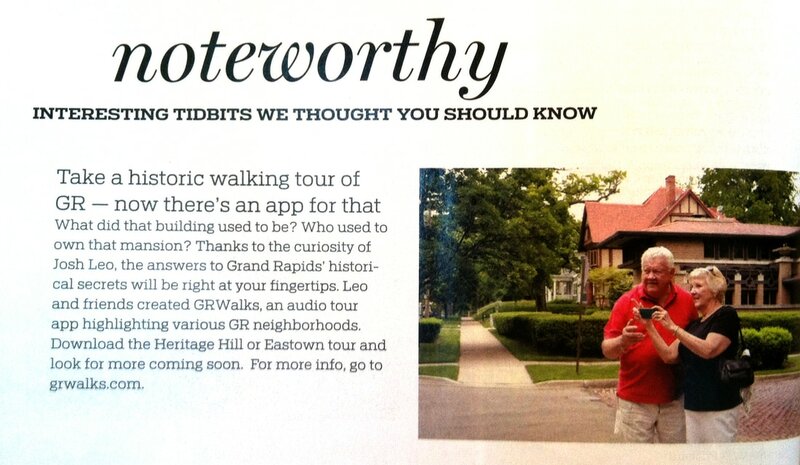 GRAND RAPIDS, Mich.–A smart phone app created by a local man is helping lead walkers through history as they make their way through the city. ‘GR Walks’ is a free program that lets you pick a walking trail in the city, then gives you historical facts as you follow it. It was created by Josh Leo, who said he received help from students at Calvin College who created paths to be added to the map. “The app is really made to bring history to the physical locations that it happened, and so getting people to learn more about their cities–getting them to really understand what made the city what it is–is really important. And I think a great way to do that is by walking through the neighborhoods, learning about the history, seeing historical photos,” said Leo. This summer, Calvin alum Josh Leo, in partnership with Calvin’s Service-Learning Center, released GR Walks, a free smartphone app that provides historical information on the different neighborhoods in Grand Rapids. The app currently has two tours: “Eastown and East Hills” and “Heritage Hill North.” Once a tour is downloaded, users can read through slides that include historical information and pictures for that location. If the user gets lost, the tour has a map of the area to get the user back on track. The Heritage Hill tour also includes audio. Both tours take about 90 minutes to complete. Since its summer release, GR Walks has been downloaded more than 500 times from the Google Play Store. The explosive popularity may be due, in part, to the ability to access information immediately, a feature that was previously not readily available. Leo hopes that GR Walks will not only help inform residents of Grand Rapids about their city, but also foster a sense of community and a desire to discover new areas of Grand Rapids. “Not only will [GR Walks] help solidify a sense of place for a person, but it will also encourage people to explore other neighborhoods in the city,” Leo said. This desire to engage with Grand Rapids and take ownership of the city is what attracted the attention of Noah Kruis, associate director of Calvin’s Service-Learning Center. “The Service-Learning Center has been working on developing walking tour guides to neighborhoods in which Calvin students participate in service-learning. When I heard about Leo’s project, I saw an obvious opportunity for mutual benefit,” Kruis said. However, the project got off to a slow start. Several tours are in the works, including one that covers the history of Calvin. In addition, the Service-Learning Center is in communication with the history department about developing tours as a service-learning component of some courses this fall. Recently, the Service-Learning Center received money from the student employment office’s contingency fund to hire a student to research and develop tours specific to neighborhoods where Calvin students frequently engage in service-learning.